خلیلی, سید محمدرضا, اسلامی فارسانی, رضا, دستمرد, علی, سعیدی, علی. (1393). بررسی تجربی خزش در کامپوزیت‌های پلیمری فنولیک تقویت شده با الیاف بازالت. 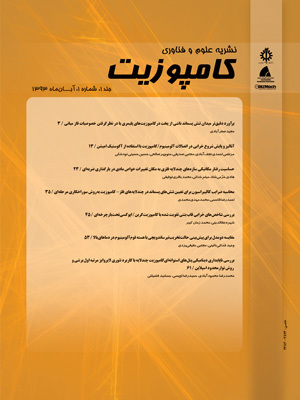 علوم و فناوری کامپوزیت, 1(2), 37-42. سید محمدرضا خلیلی; رضا اسلامی فارسانی; علی دستمرد; علی سعیدی. "بررسی تجربی خزش در کامپوزیت‌های پلیمری فنولیک تقویت شده با الیاف بازالت". علوم و فناوری کامپوزیت, 1, 2, 1393, 37-42. خلیلی, سید محمدرضا, اسلامی فارسانی, رضا, دستمرد, علی, سعیدی, علی. (1393). 'بررسی تجربی خزش در کامپوزیت‌های پلیمری فنولیک تقویت شده با الیاف بازالت', علوم و فناوری کامپوزیت, 1(2), pp. 37-42. خلیلی, سید محمدرضا, اسلامی فارسانی, رضا, دستمرد, علی, سعیدی, علی. بررسی تجربی خزش در کامپوزیت‌های پلیمری فنولیک تقویت شده با الیاف بازالت. علوم و فناوری کامپوزیت, 1393; 1(2): 37-42. چکیده رفتار کامپوزیت‌ها تحت اثر بار مکانیکی و دما در مدت زمان عملکرد، یکی از زمینه‌های مهم تحقیقات در حوزه مواد مرکب می‌باشد، چرا که پاسخ خزشی کامپوزیت‌ها بر روی عمر و عملکرد آن‌ها در طول دوره استفاده به صورت چشمگیری تاثیر گذار است. در تحقیقات صورت گرفته در زمینه خزش کامپوزیت‌های پلیمری، کامپوزیت تقویت شده با الیاف بافته شده بازالت کمتر مورد توجه قرار گرفته است. در این مقاله رفتار خزشی کامپوزیت رزین فنولیک تقویت شده با پارچه بافته شده از الیاف بازالت به صورت تجربی مورد بررسی قرار گرفته است. دو نوع پارچه بافته شده از الیاف بازالت با بافت ساده (Plane weave) و بافت اطلسی (Satin weave) برای آزمایش مورد استفاده قرار گرفت. برای بررسی اثر دما و تنش بر رفتار خزشی کامپوزیت تقویت شده با الیاف بازالت، نمونه‌های کامپوزیتی در سه دمای مختلف 100، 150 و 200 درجه سانتیگراد و همچنین دو بارگذاری مکانیکی با مقادیر 8/3 و 5/6 مگاپاسکال تحت آزمایش قرار گرفتند. مقایسه نتایج نشان داد نرخ کرنش در کامپوزیت‌های با بافت اطلسی نسبت به نمونه‌های با بافت ساده کاهش یافته است و این میزان کاهش تا حدود 68% در دمای 200 درجه به دست آمد. همچنین پارامترهای دیگر نظیر عمر و مکانیزم گسیختگی کامپوزیت‌ها مورد بررسی قرار گرفت. Abstract The behavior of composite structures under applied loads and temperatures is one of the most important topics of research in composite materials. The creep properties of composite materials have very important effect on the behavior of the structure during life time. Among various investigations on creep behavior of polymeric composites, Basalt fiber reinforced polymers has been rarely investigated. In the present paper the creep of basalt/polymer composites with two different types of basalt woven including plane weave and satin weave are experimentally investigated. Creep tests were performed at three different temperatures: 100, 150 and 200 oc and also two mechanical stresses including 3.8 and 6.5 MPa. The results showed that strain rate in satin wave is reduced by 68% at 200 oc in comparison with the plane weave. Moreover, some other parameters such as failure mechanism and creep life of specimens were investigated. Hugo, J., Sova, M., & Čižinský, J. "Creep and creep damage of glass fibre reinforced polypropylene. Composite structures." 24(3), 233-244, 1993. Raghavan, J., & Meshii, M. "Prediction of creep rupture of unidirectional carbon fiber reinforced polymer composite." Materials Science and Engineering: A, 197(2), 237-249, 1995. Bathgate, R. G., Wang, C. H., & Pang, F. "Effects of temperature on the creep behaviour of woven and stitched composites." Composite structures,38(1), 435-445, 1997. Ma, C. C. M., Tai, N. H., Wu, S. H., Lin, S. H., Wu, J. F., & Lin, J. M. "Creep behavior of carbon-fiber-reinforced polyetheretherketone (PEEK)[±45] 4s laminated composites" (I). Composites Part B: Engineering,28(4), 407-417, 1997. Govindarajan, S., Langrana, N. A., & Weng, G. J. "The influence of imperfections on the creep behavior of woven polymer composites at elevated temperatures." Finite elements in analysis and design, 23(2), 333-347, 1996. Pang, F., & Hui Wang, C. "A predictive creep model for un-stitched and stitched woven composites." Composites science and technology, 60(2), 255-261, 2000. Dutta, P. K., & Hui, D. "Creep rupture of a GFRP composite at elevated temperatures." Computers & Structures, 76(1), 153-161, 2000. Ren, W. "Creep behavior of a continuous strand, swirl mat reinforced polymeric composite in simulated automotive environments for durability investigation: Part I: experimental development and creep-rupture." Materials Science and Engineering: A, 334(1), 312-319, 2002. Houshyar, S., Shanks, R. A., & Hodzic, A. "Tensile creep behaviour of polypropylene fibre reinforced polypropylene composites." Polymer Testing,24(2), 257-264, 2005. Papanicolaou, G. C., Zaoutsos, S. P., & Kontou, E. A. "Fiber orientation dependence of continuous carbon/epoxy composites nonlinear viscoelastic behavior." Composites science and technology, 64(16), 2535-2545, 2004. Kawai, M., Masuko, Y., & Sagawa, T. "Off-axis tensile creep rupture of unidirectional CFRP laminates at elevated temperature." Composites Part A: Applied Science and Manufacturing, 37(2), 257-269, 2006. Guedes, R. M. "Lifetime predictions of polymer matrix composites under constant or monotonic load." Composites Part A: Applied Science and Manufacturing, 37(5), 703-715, 2006. Goertzen, W. K., & Kessler, M. R. "Creep behavior of carbon fiber/epoxy matrix composites." Materials Science and Engineering: A, 421(1), 217-225, 2006. Guedes, R. M. "Relationship between lifetime under creep and constant stress rate for polymer-matrix composites." Composites Science and Technology, 69(7), 1200-1205, 2009. Dasappa, P., Lee-Sullivan, P., & Xiao, X. "Temperature effects on creep behavior of continuous fiber GMT composites." Composites Part A: Applied Science and Manufacturing, 40(8), 1071-1081, 2009. Spathis, G., & Kontou, E. "Creep failure time prediction of polymers and polymer composites." Composites Science and Technology, 72(9), 959-964, 2012. Nedjar, B. "Modeling long-term creep rupture by debonding in unidirectional fibre-reinforced, composites." International Journal of Solids and Structures, 51(10), 1962-1969, 2014. رفیعی، رهام و بهزاد مظهری، 1393، بررسی و مقایسه ی روش های پیش بینی خزش در کامپوزیت های پایه پلیمری، بیست و دومین کنفرانس سالانه مهندسی مکانیک، اهواز، انجمن مهندسان مکانیک ایران، دانشگاه شهید چمران اهواز. ASTM D638, Standard Test Method for Tensile Properties of Plastics, 2010.